The dividers make it great for Cds put in ABC order and the see through helps. Love Them! Perfect for all storage needs! I ordered these storage boxes for my CDs and DVDs and they are perfect. I can see what I have and easily remove the ones I want to see or play.I highly recommend these boxes! Bought both the small and large containers. Small comes with 2 dividers to convert into 3 compartments. Lid snaps shut, but doesn't lock. Large has 3 pre divided long compartments and comes with 3 additional dividers. Large has 2 side handles that come up over the lid to snaps shut for locking. Both are heavy weight plastic, especially around the corners for stacking. If you do fill to capacity the large one, it's quiet heavy. Both will keep dust and grit away from your collection. Small one great a great size to throw your regularly used CD's in your car, truck or boat for safe keeping. The's storage boxes store so much of 1 item or many items of different types for storage. They are easy to see what's stored in them and can be neatly stored one on top of the other. 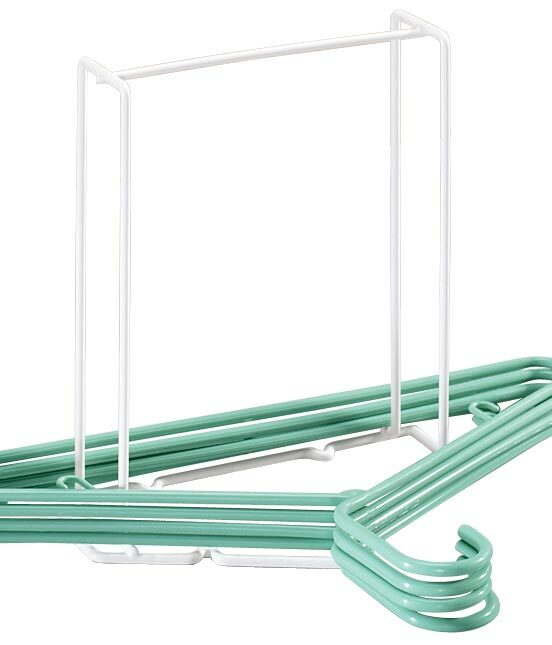 I have ordered these before-I use them for storing my CDs and DVDs. They really are handy and make it so easy to see what you have. This storage box is made very well and used it to hold dvd's that we didn't have room to keep out. Plastic is very durable. My loose media kept spilling all around. Now everything is neatly stored in these sturdy boxes which are stackable . I will be moving shortly and have hundreds of cd's. I ordered two of these and LOVE them! I just ordered two more for my DVD's. GREAT for storage and easy to organize. Don't have much room for storing our many CD's and the large box fit so many of them. They are stored so that the titles are easily read and we can readily find the CD we want. Liked this product so much we ordered another one for the rest of our collection. We have organized our DVDs in catagories such as Westerns, Comedy, Drama, Outdoor life, etc. Each box has the DVD in alphabetical order so the movie is easy to locate! They stay clean and dust free and the don't take up as much room as when they are not in the plastic container. I will be ordering many more for our travel trailer as we have many more movies there to organize. Great for storing my cassette tapes and CD's, nice lids keep contents dry and stack well on a shelf. I got several of the small storage cases to categorized my recordings. The dividers are difficult to use because they really don't lock into place properly, but the contents held them in place. I also used one to store lunch snacks, the tall sides work wonderfully! I am also ordering the large size for VIdeo Tapes. I love these products for storing my cd's and dvd's. We are in the process of looking for a new home. By using these storage boxes, we are over half-way packed. I have a collection of 194 CDs. I bought this storage box to try. I placed CDs in ABC order till full. I then ordered another box like the first one. Now I have all 194 CDs arranged in rows using the dividers on display for fast finding. Love it! these are really great. i'm definitely going to order at least one more, maybe two. they keep your CD's from getting dusty, keeps them organized and is easy to move around and i can put it pretty much anywhere. Recently moving to a new home, the tapes have not been unpacked, most ot them dad's, as he is poor health he has no interest in watching movies. Thus considering the amount of money and time invested in collecting these tapes over many years. I wanted a light weight but sturdy type of storage for the tapes. The fact I can see what is in them is and added plus. These units are excellent. I put my dvds in them by alphabet. so far I have 17. They stack great. dust free, and I can see whats inside. We have lots of VHS tapes & needed to store them. 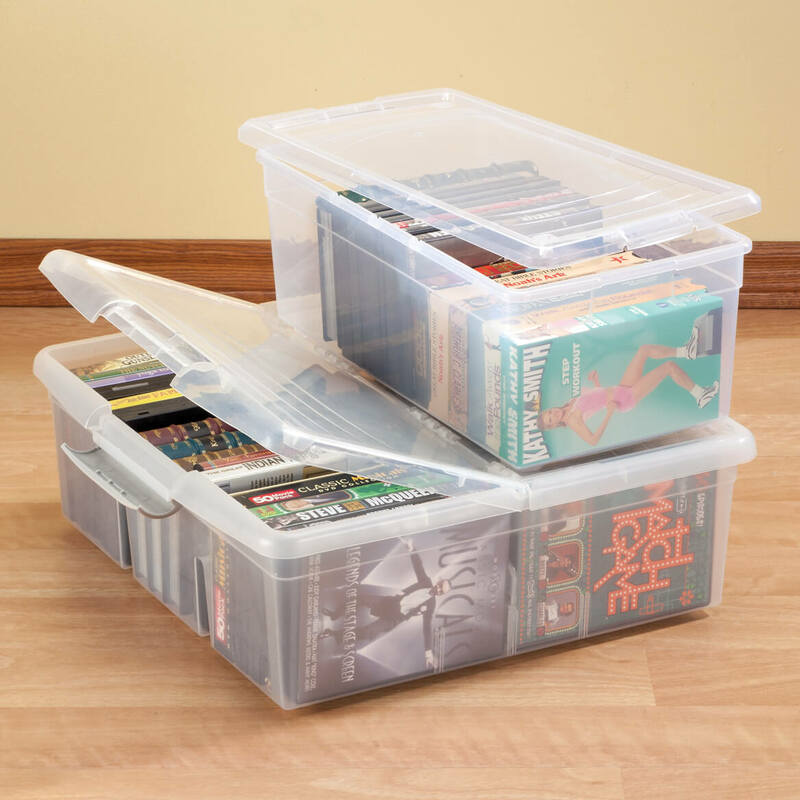 Purchase these stacking media boxes in both sizes & found them to be perfect for storage. We have many, many different types of DVD's. We were easily able to mark each box (we bought large and 2 small), to accommodate all. I used this "Stacking Media Storage Boxes" for my CD's to protect from dust and it gives more spaces for my cabinet. Advertised for CD & VHS storage but versatile enough for other storage uses. 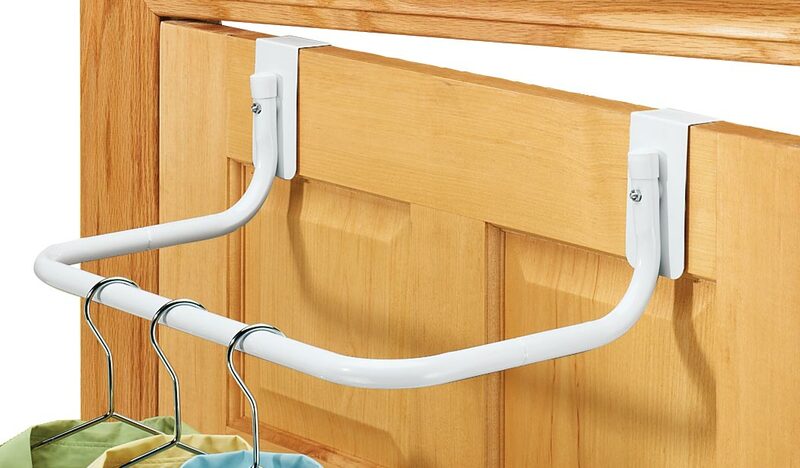 Has non-permanent dividers which allows for more flexibility in usage. Cleaning out my husband's extensive cd collection to set up the bedroom for our 4-yr old grandson. They're great to store them in a small cube. Have 6 full and need 2 more! I have purchased 6 of the CD boxes. I like to keep my CD'S in the cases so that I can see the information that it contains, songs, what track number & ect. Much less dusty than storing them on a self or rack. We store dvds in it. works very well. they can be put in small areas nicely. I have several of these already and I really love them! They make it easy to view your DVDs and CDs and since they are stackable, they don't take up much space. Would order them again! 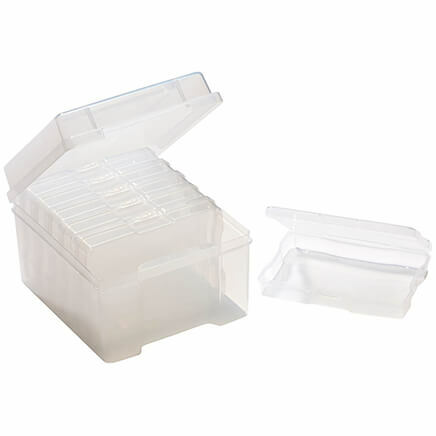 I live in a small space and this product helped to organize my cd's and dvd's in one place. It freed up other space that I needed. I am ordering the small one to complete the organization! I was able to put all my dvd's and cd's in one box. I am going to get the smaller box so I can store just the cd's in and have more room for other dvd's!! Great quality. I use Both big and small containers and they are very good to use. I use the Big containers for storing old photos in. and the Small containers I use for my PC / camera info in. I would recommend them both. As hubby & I collected hundreds of VHS tapes over the years, storage is a problem. We found these stacking media storage the best answer. We also bought the large storage container & both are great buys. The divider options are great. I can store VHS tapes and DVDs in the same box. Easy to read the labels. Only drawback is the lid needs to fit just a little tighter. The boxes do stack well. I like this, it has lots of room to put my DVD's & CD'S into the product. I did not know how many DVD's & CD's that I have. It is eaze to see all my DVD's & CD's with out having to open up to read what I would like to take out. Kepts the DVD's & CD's clean and eaze to carry them too. When I fill them up, then I will get more of them again. I would not have ordered the large media cases if dimensions were provided with the product specifications. The box is much larger than I visualized. Though it has a high capacity, the box is too large to fit into any standard size cabinets. Not very attractive to let sit out. I plan on returning the ones I purchased and would not recommend buying. Purchased two of these to store many Disney VHS tapes. They will only hold 9 with a lot of wasted space. Too bad the size is also incorrect on their description. I intend to return the large storage container. Reorganizing things and like to see what is in boxes that I am storing. stored library. This small one will be my "active file." 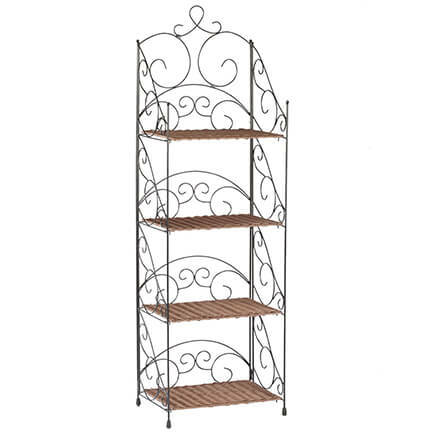 I truly loved this item, an I can't fine them anywhere, they are so great for pictures and CD's do you still carry them I didn't see them in my current cataloge. I was looking for a compact storage solution for DVD's and CD's that would fit inside a closet. I chose this size storage box because I want to reorganize my CD's & DVD's and if it works out well for me I will be reordering more of these storage boxes & maybe even one of the larger sizes. We'll see how it goes. Purchase before and the cases provide great protection. Perfect size for storage in my camper. Split lid works beautifully for access I need. It's the perfect thing to hold my music CDs. I have gotten this before and found it very useful for storing CDs and DVDs. These are great for protecting our many videos. For storage of odds and ends. I have many DVDs and need to store them properly. the boxes are just what I was looking for -- couldn't find them any more in regular stores. Would like to organize my DVD collection better. Also, I hope it will make it easier to store and view. Have several and really like them. Easy to stack and travel with. We are traveling in a RV and very handy for storing our CD's and DVD's. Can't find this product anywhere else. I am consolidating VHS tapes and CD's and purchased the small and large media box before. Very happy with them! Already have one and needed another. Love it! Looks like a great item for storing CDs. May buy more if it is as good as it looks. I have a large quantity of movies and cd's and have been trying to find the right size container to store some of them in. These look like a perfect fit. I chose these storage boxes for CDs and DVDs. Needed a CD holder my kitten couldn't get into! Personal use. Already have 3. Works great. I have CDs, DVDs and Video tapes to store. I need it to store DVDs. These are great! They provide neat organization, dry storage and easy access for my whole media library. They stack beautifully and have a small footprint in my limited storage area. About these boxes before for picture organizing and they are great! Do you just line up the DVDs? BEST ANSWER: I have CDs but I guess they would be the same as DVD. There is a divider piece that I put it one area so I could put the CDs in standing up..not piled on top of each other. I lined the dvds up vertically next to each other with the title spine facing up. The best part about these media boxes are the straight sides so the dad's line up nicely. yes, they do have at least one divider, that you can use, in case you have more than one type of movie to store in a single box. They do store nicely in these boxes. Yes, the narrow DVD's work better than the wider (series) DVD's, they just line up perfectly. Yes. This works very well. How many cassette tapes can be stored? BEST ANSWER: Thank you for your question. Small box holds either 57 CDs, 26 DVDs, 15 VHS tapes or photos, with 2 dividers and lid; 6 5/8" high. 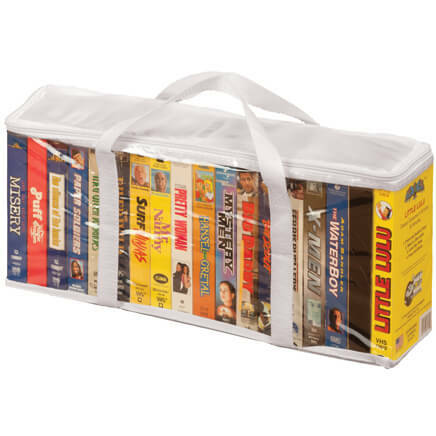 Large box holds either 120 CDs, 54 DVDs, 30 VHS tapes or photos with 3 dividers and hinged lid; 6 1/2" high. We hope this information will be of help to you. What is the dimension of the large box? BEST ANSWER: Thank you for your question. The large measures 19" long x 19" wide x 6 1/2" high. We hope this information will be of help to you. What the inside dimensions of both small and large storage boxes? BEST ANSWER: Thank you for your question. Below are the dimensions.We hope this information will be of help to you. Small: 15 ¾”L x 7 7/8”W x 6”H includes 2 optional dividers that are 6”H. Large: Has three sections that are 16”L x 5”W each. There are two non-removable dividers inside this. It also comes with optional dividers that can be used in each section.